A few weeks ago, my fiancé sent me a video of a wedding party which took place in the Russian North Caucasus’ republic of Dagestan. The wedding scene made me think that there are lands out there where Kazakh TV presenter Borat would feel right at home. The grainy images show a raucous crowd of men half-dancing, half-shadow boxing their way around the dance floor. Vodka flows and flows, spilling on the floor, which only makes the men slip and slide. At one point, the groom is roped into the proceedings by having his hair rubbed in vodka, and later, the pièce de résistanceoccurs when they unceremoniously remove the groom’s shoe, pour alcohol inside and one by one, the men take turns to drink from it. Nobody shudders or pushes it away. It is part of the plan, and it just baffled me that there are places where such bizarre behaviour occurs, and no one bats an eyelid. Welcome to Dagestan! Now, I am not suggesting for a moment that everyone in this large republic is crazy or into drinking from shoes, but one wonders what kind of life one leads in this part of the world. Since the fall of the Soviet Union, the North Caucasus has not been impervious to outside events. There are almost nine million people in this region, and like the rest of the Federation, it is beset with corruption, unemployment, government heavy-handedness and economic stagnation. Bribery means that, here, everything comes with a price. One in six Dagestani university graduates cannot find work and officially unemployment stands at 20%. It is a toxic mix, and it has led to many embracing austere forms of Islam to combat these social ills, which is starting to radically change the face of the republic. Last year, The Times correspondent Mark Franchetti reported on the appalling treatment of women in neighboring Chechnya. Uncovered women, or those not considered properly attired were subject to attacks by young men who would fire paint bullets at unsuspecting victims. It is now illegal for a woman to enter a government building without a headscarf and it is perfectly acceptable for a man to engage in polygamy. Chechnya today could not be more different. Under the tight fist of the petulant Ramzan Kadyrov, day-by-day, the once restless republic starts to look more like the Dubai of the Caucasus. It is stable, and flooded with money from Moscow, is seemingly prosperous, but has implemented laws that would make the Saudis blush. 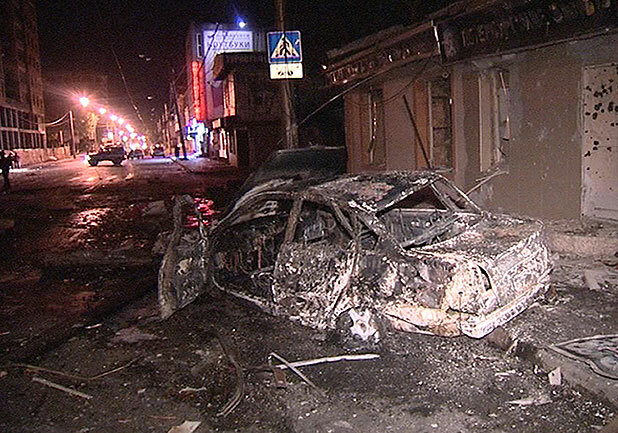 Now Dagestan is slowly transforming into what Chechnya used to be, or still is. In a similar vein, it was due to a series of suicide bombings that the outside world first learnt that all is not well in this rarely heard of part of Russia. In March 2010, Moscow’s Metro station was targeted by two female suicide bombers, who together, killed forty people and injured 100. Many suspect that one of their intended targets was the Federal Security Service (FSB) whose offices sit above the Lubyanka station. We will never know for sure. In response, Moscow vowed to be tough on the burgeoning Islamic insurgent movement, and sent special forces, the police and the regular military to look for boyeviki or insurgents who have “gone into the forest”, meaning to join the bands of jamaat or insurgent units which prey on the authorities. Locals suspect that as many as 1,000 to 1,500 armed men at any one time seek refuge in the forest in order to plan and orchestrate terror attacks against the security services. According to Spiegel traffic cops working on roads leading to the capital Makhachkala have to be protected by elite forces from the Interior Ministry, because in 2009, 58 police officers were killed. Most are stressed and exhausted from the job, and unfortunately for them, the population does not trust them. Spiegel also notes that insurgents are gaining the upper hand financially through their exploitation of the local population claiming that money given to them is a form of charity known as zakat. Banks and businesses are robbed, and in most cases victims are sent text messages to pay up, believing they have no choice, since it is the only way of buying protection if in case the insurgents take over, and succeed in creating a pan-Caucasian Islamist caliphate. Dagestan, which means “land of the mountains”, is composed of a potpourri of more than 32 different ethnic groups and languages. They include: Avars, which is the largest, followed by Dargins, Kumyks, Lezgins, ethnic Russians, Laks, Tabasarans and Nogai. Dagestan is also famous for being the birthplace of Imam Shamil who led campaigns against Tsarist forces. It took roughly 300,00 troops to crush the resistance movement. Under the Soviet Union, Dagestan was an autonomous region, largely secular, where Sufism mixed with local traditions. In the early 1990s, like the rest of Russia, Dagestan became a playground for the oil and caviar mafias and kidnappings were commonplace. In 1999, fighters who were busy fighting in Chechnya’s war against the Russians, crossed over the border in order to declare an independent state and stage their own holy war against the Russians. The fighters were imbued with radical interpretations of Islam, which at the time had few followers in Dagestan. In stark contract, the republic was a awash with brothels, beauty parlours and casinos. But what a difference a decade can make. Fast-forward to 2011, and the majority of Dagestan women cover their hair, beaches where men and women used to freely mix have been replaced with segregated sharia beaches. Shops selling alcohol have been blown up and according to an excellent article recently published in Newsweek; two school principals who were against girls wearing the hijab were killed. Women are heavily scrutinized for their attire more than ever before. Bakanai Huseinova, the manager of a financial company complains that “first, they make deadly threats for wearing a bikini; next they will want us to stop wearing our shorts and jeans, then ban us from going to restaurants and universities”. Dagestan’s current leader Magomedsalam Magomedov is in the midst of trying to implement a government-sponsored programme to improve the image of Islam. He has announced that Dagestani’s Islam is “one of the purest in the world”, and says this is proof of the government working “to eradicate gambling dens, drug addiction and alcoholism”. It is entirely likely that whatever pressure is brought to bear within Dagestan’s social sphere, either from Moscow or locally, women will be the first to feel the pinch. They should pay close attention to their Chechen counterparts. In conclusion, Dagestan is and will remain for the foreseeable future Moscow’s greatest security challenge, President Dmitry Medvedev has admitted as much, and in the glare of next year’s election, as well as the winter Olympic games in Sochi, it will be up to the government to take a robust stance. Car bombings, assassinations and economic disintegration are just footnotes in the story of Dagestan’s painful dissent into chaos, which looks far from over.